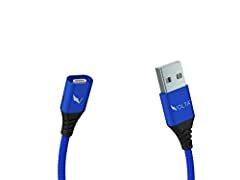 REVIEW: VOLTA – BEST Magnetic USB Charging Cable? The VOLTA is a singular charging system that will work with just about any device you own – and look great doing it. It’s a sleek charge and sync cable that’s a standard USB on one end, and an open magnet on the other. It comes with a magnetic tip that can turn the open end into a Micro-USB cable. 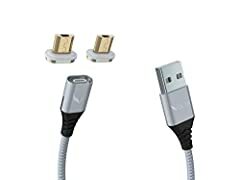 Just install the magnetic connectors into your phone, tablet, or laptop ports, and you’ll be able to instantly switch the same VOLTA cable between your different devices whenever you need to. The connectors are strong enough to stay in your devices without falling out, but can be removed with no extra tools or wear and tear. The sturdy, anti-scratch aluminum shielding around the heads ensures the ‎lasting, pristine condition of the connectors. PBV braiding and intelligent strain-relief collars ‎on the cable give it astounding agility, strength and flexibility, and two perfectly aligned, N52-grade Neodymium reversible magnets in 360° orientation – at both ends – deliver an immediate, powerful connection in an instant. No more stabbing your device to death trying to connect for a charge. Just get the end of the cable close to the connector, and it snaps right into place. We’re a new startup based on The Gold Coast of Australia. Made up of award-winning engineers and creative designers. We’ve worked tirelessly to create a singular cross-device magnetic charging system. That will work with just about any device you own – giving people peace of mind. Beyond building amazing gadgets the core of our focus at VOLTA. Is to change the lives of millions of people in Africa. We use a huge amount of the proceeds of everything we sell to go towards building schools in third world nations and equipping the youth of the generations to come! This is an ad, not a review. The only thing I’m bothered by is the extent of the protrusion of the adapters – it could have been a little less bulky. Also, when you click on the link, click on the image, to see the items that are on the site. 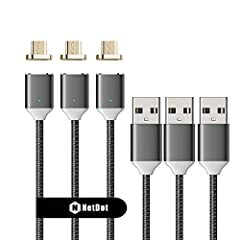 New Volta Cables (only available through Indiegogo) have QC 3.0, just to let you know. Love to watch a video featuring a Xiaomi phone on my Mi MIX 2. I’ve got a magnetic charging cable that is a different brand but looks almost identical to the silver one you’re reviewing. I’m in and out of my car a lot and I love being able to quickly and easily plug and unplug my phone every time I get in and out. No mention of data transfer so I assume this cable cannot be used for that? late to the party but how strong is the magnetic? If I hold the phone in the air will it stay attached or easily snap off? 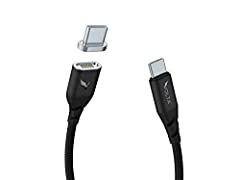 This is identical to a cable I picked up on Amazon. Now question is, was that just a clone, or is it in fact just a blank OEM that various companies put their branding on? I returned the one I bought – didn’t fast charge my s9+ and the magnetic end with the light got pretty warm when in use. This cable seems a bit too identical for comfort. Can I leave this in while wireless charging?